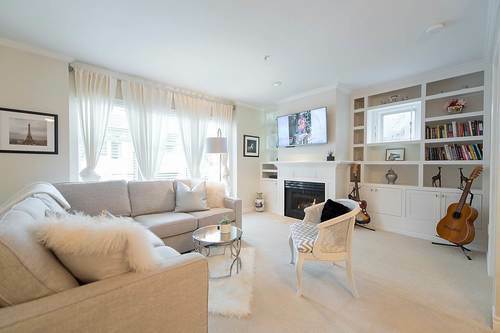 This bright & airy, beautifully updated 2 bdrm, 2 bathroom Fairview condo near Cambie Street features a generous open plan with a quiet treed outlook to the courtyard of Connaught Estates, one of Cambie Village's coveted complexes. The spacious living room has a gas F/P with custom built-in surround storage & access to the private deck. The kitchen is perfect for entertaining with lots of work space, S/S appliances, stone counters & bar seating. Nicely separated bedrooms include king-sized master suite with walk-in closet & 5 piece ensuite with double sinks. Features include loads of natural light, lots of storage, laundry room, Berber carpeting, guest shower with 6 shower heads! 2 parking, one storage locker, 2 small pets OK, rentals currently at max. Don't miss this one in Fairview, Vancouver! Contact Ron Parpara for this or similar Vancouver properties for sale in Fairview Vancouver West at 604-275-2997 or rparpara@sutton.com.